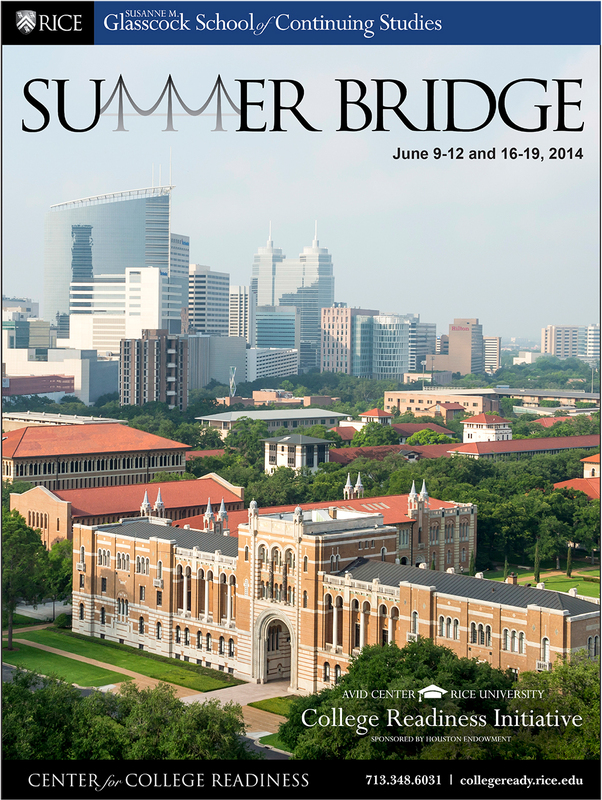 The next program for the College Readiness Initiative is the Summer Bridge, offering two weeks in Algebra Readiness and Communications for incoming freshmen of participating districts June 9-12 and 16-19 at Rice University. In September 2011, the Houston Endowment sponsored a collaborative between our Center for College Readiness and the AVID Center in partnership with the College Board to address the need for a comprehensive college readiness system in Houston. The collaborative, known as the College Readiness Initiative, is committed to helping students in 13 Houston-area school districts prepare to succeed in academically rigorous courses through carefully constructed learning opportunities to increase the number of students who graduate high school ready for college. In May, the Houston Endowment chose to extend the funding for the College Readiness Initiative through the 2014-2015 academic school year, allowing us to continue on with this valuable service to the greater Houston community.